Are you "itching" to start your vegetable garden? One way to jump-start the growing season is to start seedlings indoors. There are many advantages to starting your seeds indoors in addition to allowing anxious gardeners to "get their fingers dirty." In theory, plants started indoors will be bigger and produce faster than seed planted directly into the garden. Many of us wait until the cell packs of tomatoes and peppers are available at the retailer. Starting your own seed allows you to raise the varieties you want and not rely on what the retailers have available. 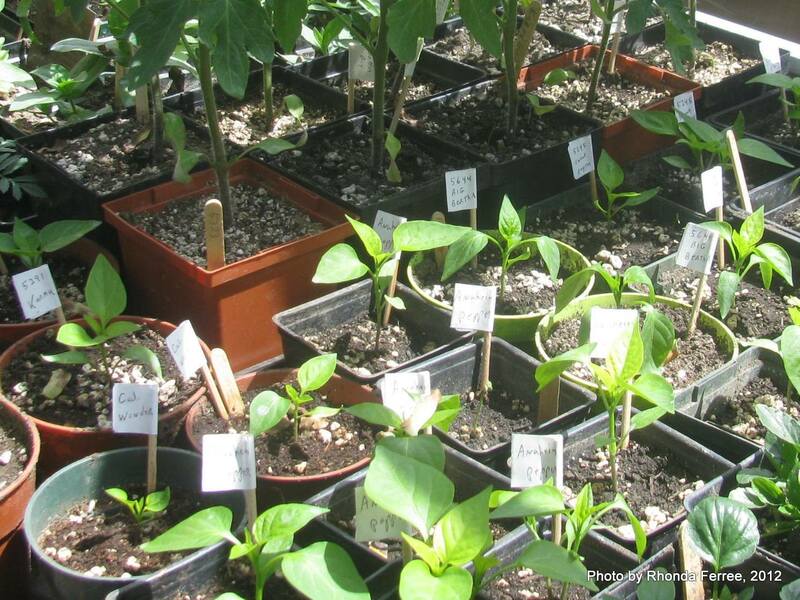 To start your seeds indoors, all you need is a container and tray, potting mix, and labels. The container should have drainage holes and could be anything including egg cartons, cell packs saved from last spring, or special seed starting kits you purchase. The tray or flat will collect excess water coming through the drainage hole. Now start filling the container. Seeds usually germinate best in a light mix developed especially for starting seed. Germinating mix is readily available at most stores. Fill the containers full and then water thoroughly with a light mist. Most germinating mixes are hard to get wet, so take your time, and keep checking with your finger to be sure the mixture wets thoroughly. Next, plant the seed and label them carefully. Don't worry about planting too closely, because you will thin them later. Check the seed packet to see whether you should cover the seeds or not. Some seeds need light to germinate and should not be covered. Others should be covered with a light dusting of additional germinating mix. Use a mister to lightly water the covered tops. Keep the germinating mix moist, but be careful not to over water. You might want to enclose the whole container in plastic or use a clear plastic cover to help create a more humid, greenhouse-like environment. A clear plastic deli container makes a great mini-greenhouse. Once the seeds start to sprout, remove that cover. Time seedlings so they will be ready to plant outside after the last frost-free date. Here is a seed-starting timetable to help you determine when to start your seedlings. Seed packets usually contain this information too. The average date of the last spring frost in central Illinois is April 15. This means there is a 50 percent or less chance of frost on this date. The actual frost-free date for central Illinois is May 12. So to plant tomatoes on May 15th, you'll need to start tomato seeds indoors between March 20th and April 3rd. Good luck and have fun jump-starting your garden. For more information, go to University of Illinois Extension's "A Taste of Gardening" website at http://urbanext.illinois.edu/tog. Want to learn more about starting seeds indoors? Join Extension Horticulture Educator Kim Ellson during her upcoming Four Seasons Gardening webinar as she discusses key elements for successful seeding this spring. Strengthen your skillset and learn about germination triggers, breaking dormancy, scheduling, seeding methods, damping off, and hardening. Seed Starting is presented live on January 31 at 1:30 p.m. and again on February 2 at 6:30 p.m. All sessions are available for live home viewing. Contact your local Extension office to inquire about attending the webinar at the Extension office. Following the session, a taped version is available on YouTube. Registration and YouTube information are found at http://web.extension.illinois.edu/hmrs/4seasons.